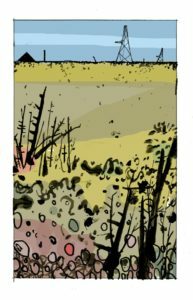 A fully illustrated 64-page hardback book about Dungeness, white egrets, climate change, Europe and apocalypse. Limited to 100 copies. As part of Kickstarter’s Make 100 initiative, and working with renowned landscape artist Maxim Griffin, The White Heron Beneath the Reactor is an illustrated landscape punk essay exploring the bleak, otherworldly and captivating landscapes of Dungeness, the effects of climate change and a warming world, our relationship with continental Europe, and the looming fear of apocalypse. This entry was posted in Uncategorized and tagged Climate Change, Gary Budden, graphic, kickstarter, Maxim Griffin. Bookmark the permalink.